When I first got my iPod touch a few years ago I used it mainly for email and checking a few online sites. I wasn’t really aware of all it was capable of and all of the devices that you could use with it. Then just before Christmas I was lucky enough to get the latest version of the iPod touch and the iPod nano as well. The nano encouraged me to start using iTunes and downloading all my CD collection. Before I knew it I was turning to my iPods for the latest music. Problem? I didn’t like having to always wear my earphones to listen to the tunes. That’s when I started looking into all the different devices I could use to make the most of them. The Sharper Image was already one of my favorite go to websites for the latest and greatest electronics. What I didn’t realize was that they had THIRTY different products to use with your iPod! I was super excited to check the iPod electronics out! However, when I saw the Wireless Indoor / Outdoor Speaker Pair and Dock I knew it would be a perfect fit. Your fun will not be boxed in, or limited to one indoor space – not when you have these Indoor/Outdoor Wireless Speakers. Heading out to the pool, or out to the BBQ? Grab these wireless indoor/outdoor speakers with, and make tracks. You won’t be dragging wires behind, because they are cordless. Outdoor speakers that don’t need to be babied near the pool or hot tub – that’s what you get with these weather resistant Indoor/Outdoor Wireless Speakers. A few splashes of water from an unexpected rain shower or from the pool aren’t going to ruin these 900 MHz beauties. You can relax and enjoy the clear sound, without fussing over wires or raindrops. 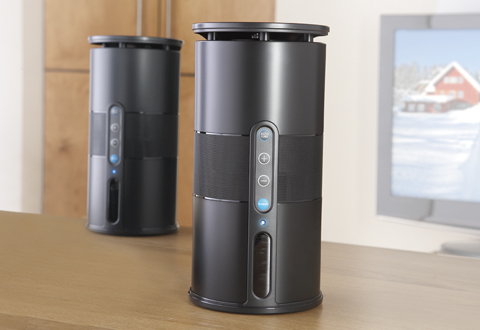 The Indoor/Outdoor Wireless Speaker system features a dual power transmitter. Use AC power, or batteries if you’d like – you get complete freedom whenever you want. These wireless indoor/outdoor speakers support multiple audio inputs including iPods, iPhones, MP3 players, computers and much more. Remote included. These are great because I use them all the time when I’m cleaning. I have one in my kitchen and the other in my dining room. They work incredibly well. I don’t recommend turning them all the way up because I do think you’ll blow the speakers easily. If you use them reasonably they are still pretty loud and they sound great. I personally felt that these were the type of product that a written post just wasn’t enough and decided to show you a video. This is my actual set in my home. As you can see these little speakers pack quite the punch. Plus, since they are easy to use I love being able to take them where ever. You’ll often find them in my scrapbooking room! The Sharper Image has offered one Mom Spotted Reader a Wireless Indoor / Outdoor Speaker Pair and Dock!!! 1.) Visit The Sharper Image and tell me what other item of theirs you love! 4.) Blog about my giveaway- with a link back to here AND The Sharper Image 4 entries (get two more if you include a photo of the giveaway). That’s many chances to win a Wireless Indoor / Outdoor Speaker Pair and Dock!!! I love the Water Globe Air Purifier & Air Freshener. I would also like to try the white noise machine! These speakers are awesome!!!! I also really like the Q zone quiet hair dryer!!! I’m a mom spotted FB fan!!! I like you on Fb already – aleksandra n.
I LOVE the zero gravity hammock, it looks super comfy!!! The portable chair with speakers is cool! I like the zero gravity hammock. The things an ol’ geek like me could do with the Video Glasses with 55″ Screen boggle the mind. If I had my druthers this is what I’d want. the Sound Soother White Noise Machine is something else that I’d like to try. I like the tyPad at the Sharper Image. I like the Sound Soother White Noise Machine, beats keeping a fan on all year long. I think I put my old email address in this first entry, it’s still valid, just have been having a lot of issues with it. I would love their ChiliPad!!! Following the Sharper Image on twitter. I like alot of things but the Sound Oasis Sound Therapy System sounds like something I sure could use! I lobe the tyPad for the iPad. It would make entering blog giveaways so much easier! I follow Sharper Image on Twitter as Anneliz702. I would love to get azero gravity hammock for my husband! I like Sharper Image on FB as Anne Loyd. I let them know you sent me their way and told them I loved the tyPad fir the iPad. I am a facebook fan of yours. Thanks for the giveaway! I posted about this giveaway on my facebook page 05-09-11. I’m a a Fan of Mom Spotted on Facebook – fb wasn’t cooperating for me to leave you a comment but I tried! I follow and am subscribed by email. (Drool) The Video Glasses with 46″ screen look awesome! I like the Flying Fish RC Mini Helicopter. Thanks. I would love to have the Zero Gravity Hammock. I love Sharper Image products. I would also love the Ionic Comfort Air Purifier. i like the zero gravity hammock! The 3N1 Beach Chair looks really comfortable! Thanks for the contest! I also like their Wireless Roll up Keyboard – Sharper Image has lots of cool stuff!! I would also like the Smart Shopper List Organizer. I follow Sharper Image on Facebook. My hubby would love any of the massagers (pains that the docs have yet to agree on), they would help him unwind at the end of the day. I also love the Umbrella Pole iPod Doc and Light! The zero gravity hammock would be heavenly. i love their neck massagers! I also like the solar radio. I’d love to have a TerraTrike. I see an old couple riding these on the trail every day—pretty cool! I like the nightwave sleep aid. I like the SmartShopper List Organizer! I’d like to own the Ionic Comfort Air Purifier. OH, I need a ANSR: Light Therapy in a bad way! 1 — I follow your blog. 2 — I follow your blog. I like the portable chair with speakers! The Memory Master CD Recorder is a must have! All my LPs to transfer. I want!!! I would like the Ionic Comfort Air Purifier. Oh man the Sona Anti Snore Pillow would be great for my hubs! I would love to try that skatecycle, although my list goes on and on at the sharper image! We are air purifier fanatics and the Sensing Air Purifier looks like something we wouldn’t mind having. ChiliPad is another item I would love to have. 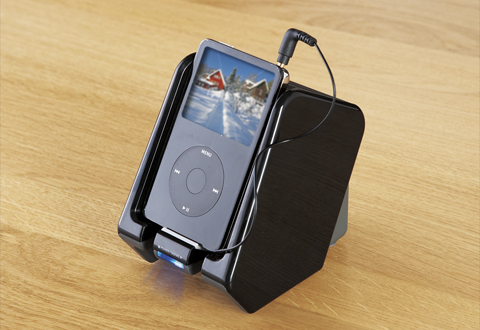 would love to try the ipod tower stereo system! and also would love to win this! I like the Shark Gaming Chair. It has built inspeaker and a subowoofer too. sweet! I love the i float pool speaker! I would like the Water Globe Air Purifier & Air Freshener. Thanks! I follow the Sharper Image on Twitter (@jenalber). I love the 3N1 Beach chair! I also would like to own a Portable Chair with speakers from The Sharper Image! I also love the Laser Star Projector! I am a Fan of The Sharper Image on Facebook! I like the outdoor ping pong table. (1) I already follow your publicly on GFC. (2) I already follow you publicly on GFC. (1) I subscribe to your blog by email. (2) I subscribe to your blog by email. Well I could list a thousand things I want from Sharper Image, but narrowing it down, I’d like the “COMFORT MASSAGE CHAIR”, the “BACK-2-LIFE BACKPAIN RELIEF SOLUTION” or the “MOTORIZED TIE RACK”. Dorky, I know, but I’m so tired of DH’s ties falling off the hanger! I’m twitter following @wwwSharperImage ! I’m a facebook MomSpotted fan! I would love to get the Solar Pool Skimmer for our pool. Thanks for the chance to win! I like the K-PAK ReconstRx Vapor Iron on sharper image. I love any of their Blue-Air Air Purifiers, the pollen this year has been terrible, so therefore so have my allergies! I like the Umbrella Pole iPod Doc and Light. I love the zero gravity hammock! I also want a nice Nightwave Sleep Assistant! The Ionic Comfort Air Purifier would also be amazing to have! My husband needs the Nose & Ear Hair Trimmer from Sharper Image! I also like the Compact Ionic Comfort Air Purifier. I would love the Deluxe Foot and Calf Massager. I’d love to get the Zero Gravity Hammock for camping. I’ve been looking for one. There are soooo many. One I could really use is Digital Film and Photo Scanner. I like the IonFlow Air Purifier. I would love their comfort massage chair. The PedicureSpa Salon Footbath is another product that I would LOVE to try. I bet it’s so relaxing! would make my hay fever season so much more bearable. I would like their Wireless Home Security Camera. I’ve been wanting to see if that would work at my house. I’m a Sharper Image facebook fan! I would love to have the Nightwave Sleep Assistant from The Sharper Image. the zero gravity hammock looks heavenly! I would love to own their Sound Soother White Noise Machine. I LOVE the Zero Gravity Hammock!!! So COOL!!! already a blog follower entry 2!!! subscribed to blog e-mail entry 1!!! subscribed to blog e-mail entry 2!!! fan of momspotted on facebook!!! became a fan of sharper image on facebook! !